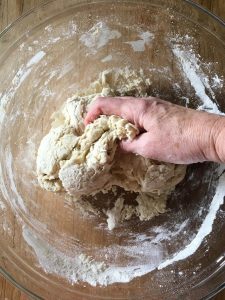 There is no better place to start bread making than by kneading your dough by hand. 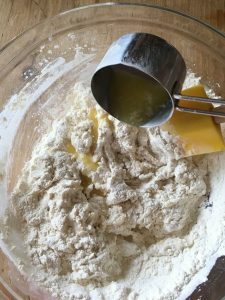 It gives you a real feel for the transformation that takes place when wheat flour and water are combined. 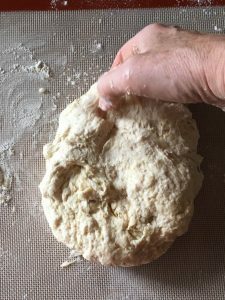 Even if you use a stand mixer or food processor to mix your bread dough or even if you try the no-knead method, you will learn a great deal about bread making from kneading by hand at least once. Here is a step-by-step illustration of kneading by hand using our recipe for Butter Topped Toasting White Sandwich Bread. Place the water into a large bowl. 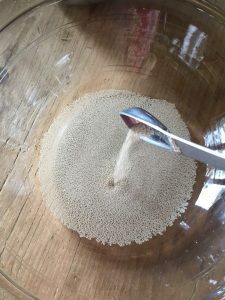 Then add the yeast. Let it sit until the yeast dissolves, for about 5 minutes. 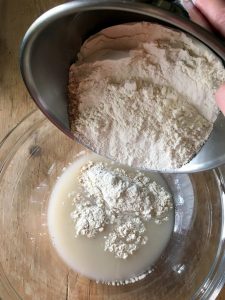 Add the flour and dry ingredients to the water. Stir the flour into the water with a rubber spatula. 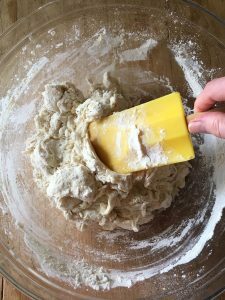 Stir the mixture with a rubber spatula or dough scraper until the flour is moistened. Add the melted butter, if your recipe calls for it. 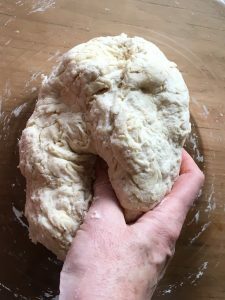 To knead dough by hand, start by squeezing with your hands to bring it together into a loose ball. 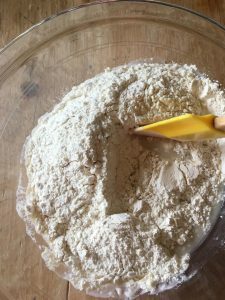 Continue squeezing and pressing the dough together to pick up all of the flour in the bowl. As the dough comes together, rub the ball of dough against the inside of the bowl to pick up every last bit of flour. 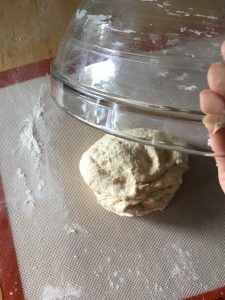 Transfer the ball of dough to a lightly-floured work surface. Here I am working on a silicone baking mat that I’ve dusted lightly with flour. Dip your hand the flour. 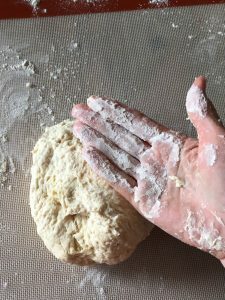 This light coating of flour on my hands helps keep the dough from sticking. 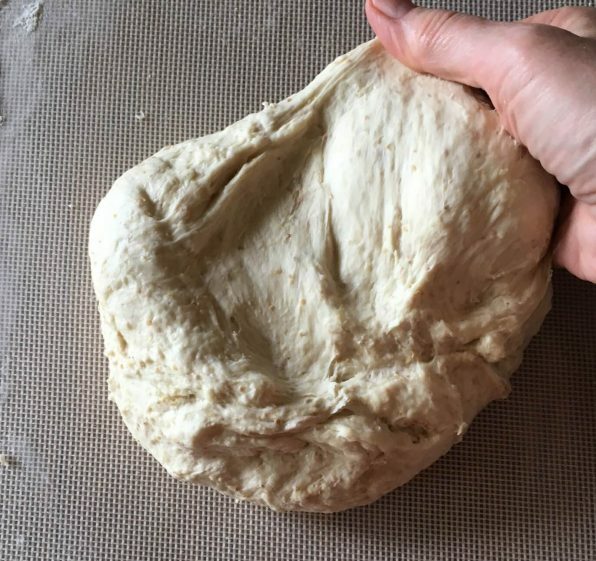 Press down on the dough without squeezing. Pat it into a flat ball. 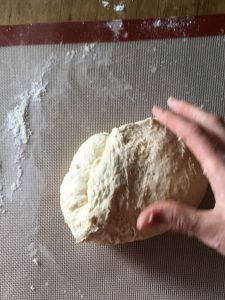 To knead the dough, pick up one edge of the dough and fold it over. 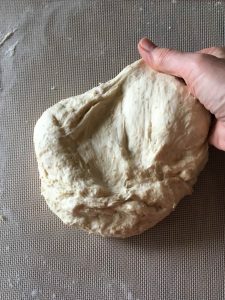 Fold the dough over onto itself. Repeat the last couple of steps several times. 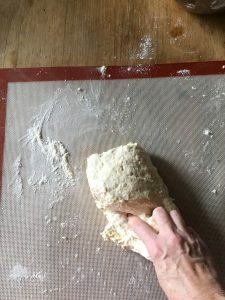 Once the dough feels somewhat firm under your hand, start to slap it onto your work surface. This is noisy fun and effective. First lift up the ball of dough. Then slap the dough back onto the work table. 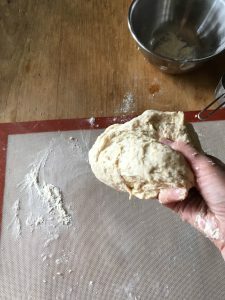 Fold the dough into a neat ball then lift it up and slap it down again. Do this for several minutes. 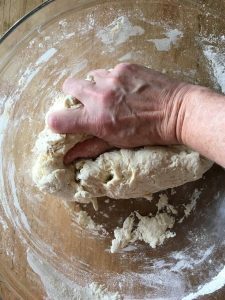 When kneading bread dough by hand, time is your friend. Cover the ball of dough with the bowl you mixed the dough in or a with a kitchen towel. 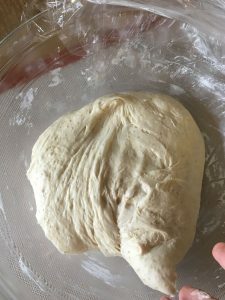 Let the dough sit for 5 minutes. 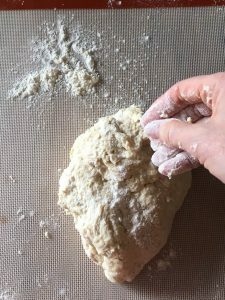 Once the dough rests, the gluten relaxes making it easier to knead. See how much smoother it is? 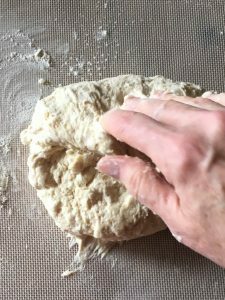 Keep folding, turning and pushing the dough until it feels springy under your hand. The dough will be smooth and alive. 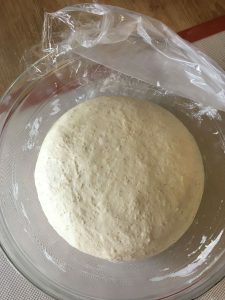 Once the dough feels smooth and springy, place it into a greased bowl. Cover the bowl tightly with plastic wrap and a kitchen towel. 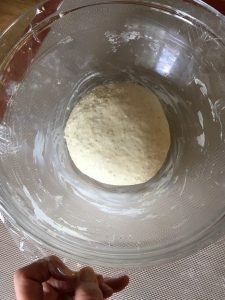 Let the dough ferment and rise in a draft-free place for the time suggested in your recipe. 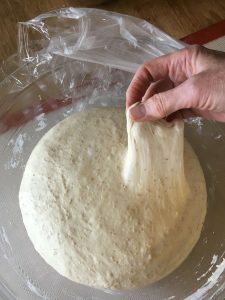 As it ferments, you may see moisture in the dough collect on the plastic. 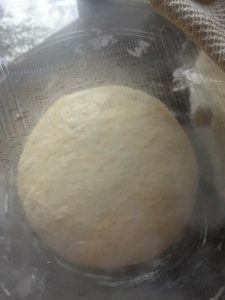 After 2 hours, the sandwich bread dough is alive. It has doubled in volume. The bread dough is silky smooth as you can see here. 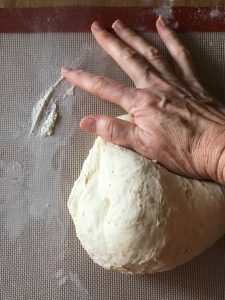 Press gently on the dough using the fingers on one hand. You’ll see the dough deflate. 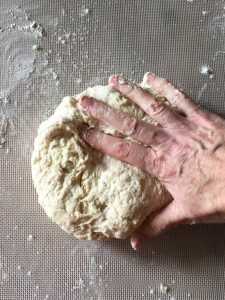 I press from the outside egdes and gather the dough up into a ball as I am doing this. The siky dough can be rolled into any number of shapes. 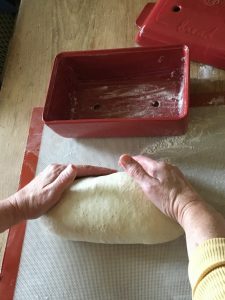 Here I am rolling it into a tight oblong shape to fit my loaf pan.